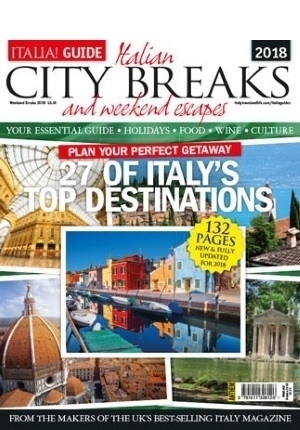 The ideal subscription for anyone who loves everything about Italy, an Italia! magazine subscription offers up the defining architecture, landscape, food and spirit of the jewel of the Mediterranean. Filled with breath-taking photography and travel features, Italia! magazine is full of ideas for your next trip – whether you’re headed north to the mountains, south to the islands of Sicily and Sardinia or exploring the rolling green Tuscan hills. It’s a true feast for the eyes as well as the stomach, with incredible Italian recipes featured in every issue – making the most of what’s seasonal and fresh, with an emphasis on hearty family dishes in true Italian style. Treat yourself or someone special to an Italia! magazine subscription today and get a sunny dose of the Mediterranean through your door every month! Get instant digital access to the latest issue of Italia! Magazine to read immediately on your PC, tablet or mobile while you wait for the print subscription to arrive. Planning your next trip? With an Italia! magazine subscription, you’ll go off the beaten track to lesser known areas across this magnificent country – exploring mountains, lakes and hills as well as deserted beaches, beautiful villages and incredible architecture. With an emphasis on uncovering the local’s Italy, the team behind Italia! magazine share their latest trips and tips for your travels – the perfect inspiration for an unforgettable holiday. There’s also plenty of handy guides on exploring the more popular cities, too – find out how to eat like a local in Venice and avoid the tourist traps, as well as the best views of Rome or the secret places in Florence. With an Italia! magazine subscription, adventure is never far away. If you’re looking to take a little Italy inside your home, you’ll find it in abundance in every issue of your Italia! magazine subscription. With fabulous recipes to whip up in your own kitchen, there’s so much more than pasta and pizza. Dine like an Italian with fresh vegetables, fragrant herbs and sizzling fish and meat – plus the crowd-pleasing delicious desserts you definitely won’t want to share. Culture – events, art, architecture and more – don’t miss out on the best of Italy this year! How much is Italia! magazine? How often is Italia! magazine published? How can I buy Italia! magazine? How many issues of Italia! magazine are published each year?